I have a love hate relationship with Bombay. (Yes I know I should say Mumbai but it’s always going to be Bombay to me). The first time I visited I was terrified! I was eight years old and there was simply too much hustle and bustle for my little head to cope with. The second time I was sick so I really don’t remember much but it was a visit in my early thirties that made me love this place. My memories are filled with traffic and noise and temples on street corners. I can still see the street hawkers, rickshaws and grand British architecture. Most of all I can smell the pau bhaji and taste the mango kulfi on Juhu Beach Road. Everywhere there are people selling food, cooking food and eating food. It’s just one of those places where you want to pop into someone’s kitchen and take a seat. So I was really happy when I was sent this book. Reading it is like being transported back to Bombay. 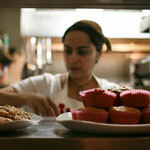 Back in time almost but also it’s been a chance to get to know Cyrus Todiwala a little better. I’ve met him a few times now and he’s passionate, hard working and absolutely humble about his success. He is also a real advocate not only of Indian food but of the restaurant and catering profession supporting many, many causes here in the UK to help the aspiring ones get a step on the ladder. I loved his memories of childhood, tales of catering college and most of all his enterprising spirit. In Bombay there is an entrepreneurial spirit like no where I’ve ever experienced before. Wheeling and dealing is spontaneous and there is an idea around every corner. I could almost see Cyrus walking around looking at the orange juice sellers eyeing up the thrown away peel, stroking his beard and having the ah -ha moment to make and sell candied peel. There is no wastage in India least of all Bombay. You will learn a lot about India, Indian culture and most of all the mish mash of food that is so unique to Bombay. Cyrus incorporates recipes from his family but also the many different types of neighbours that live side by side with little dispute. You will not have heard of many of these dishes. Don’t expect kormas and bhunas or sag aloo and aloo tikki. This is not your average restaurant food. The book itself is easy to follow though I did find the writing rather small. The photography is stunning and I am so envious of Helen Cathcart to have the opportunity to shoot the wonderful street scenes. She has a fabulous eye that makes this as much a travel journal as a recipe book. The recipes are divided into Snacks, Seafood, Meat and Poultry, Vegetables, Street Food, Breads and Rice, Pickles and Chutneys, Desserts and Drinks. I found something new in each one and I have been cooking Indian food for over 20 years. 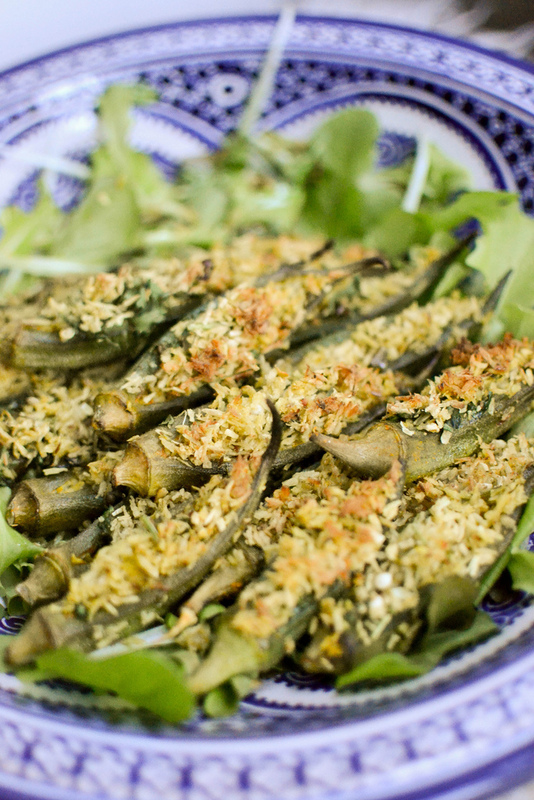 I made Bhareli Bhindi which is Okra stuffed with coconut and spices as I am a huge fan of this vegetable and always looking for different ways to cook it. I had this with a light salad and a glass of white wine for supper. Indian food doesn’t always have to be a massive three course affair. I had a lot of the stuffing left so I used it up in tomatoes the next day. Pooris are one of my favourite foods ever. On the overnight train from Bombay to Rajkot, my paternal grandfather’s village, we always picked the carriage that would pull up in Ahmedabad next to the poori stall. There is nothing better than poori, chai and pickles for breakfast. 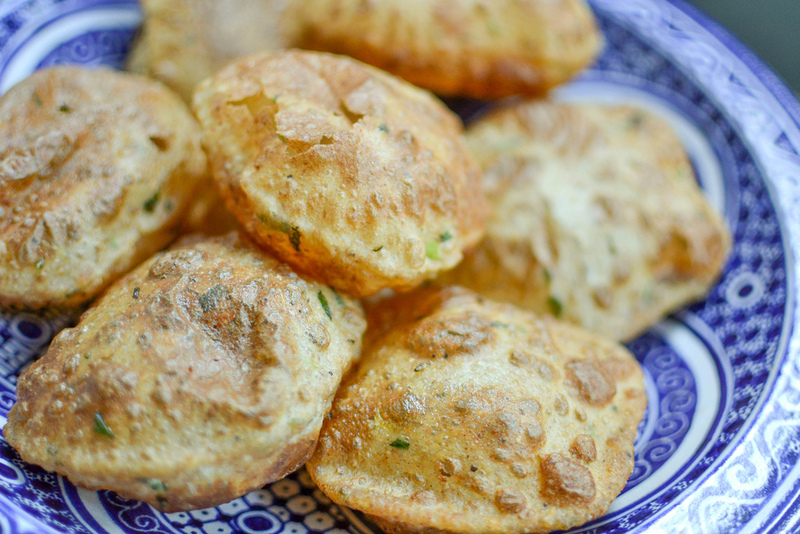 Poori are a fried chappati of sorts and the dough varies enormously. I use turmeric and ajowan seeds in my traditional Gujarati version but Cyrus shares his wife Pervin’s recipe which has neither but green chillies, fresh coriander, crushed pomegranate seeds and cumin instead. There are many more recipes I would like to try. Gajjar Achar – Carrot Pickle, Parsee Semolina Pudding – Doodh No Rawo, Bombay Caramel Pudding which has the wonderful name of Lagan Nu Cushtarr as it’s part and parcel of a Parsee wedding. There are more recipes from my fellow foodies below as this book has travelled the UK this week. Do pop by and take a look. And you can also win a copy. To enter simply send an email to stephanievizard@hardiegrant.co.uk by tomorrow, Sunday 10th November, UK residents only. Thank you to Hardie Grant for my complementary copy. 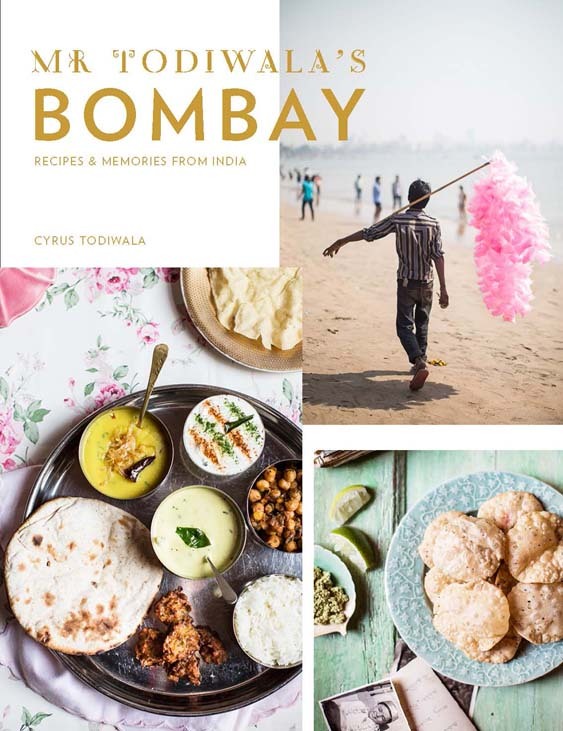 The Spice Scribe – Mr Todiwala’s brand new book: Bombay, or bust? Firmly on my wish list. I’m taking the plunge and finally going to India in the new year. Not Bombay (Mumbai) but this has stoked the excitement. So exciting. Where are you going? Excellent roundup for the tour. Well done. Gorgeous gorgeous okra and fab and personal review. Lovely review, the book sounds brilliant. Have only visited Kerala in India (absolutely loved it, the food was wonderful) but this looks amazing as do those Pooris. I tried pooris for the first time this week – with coriander chutney and a fiery hot sauce that looked like water, very deceiving! 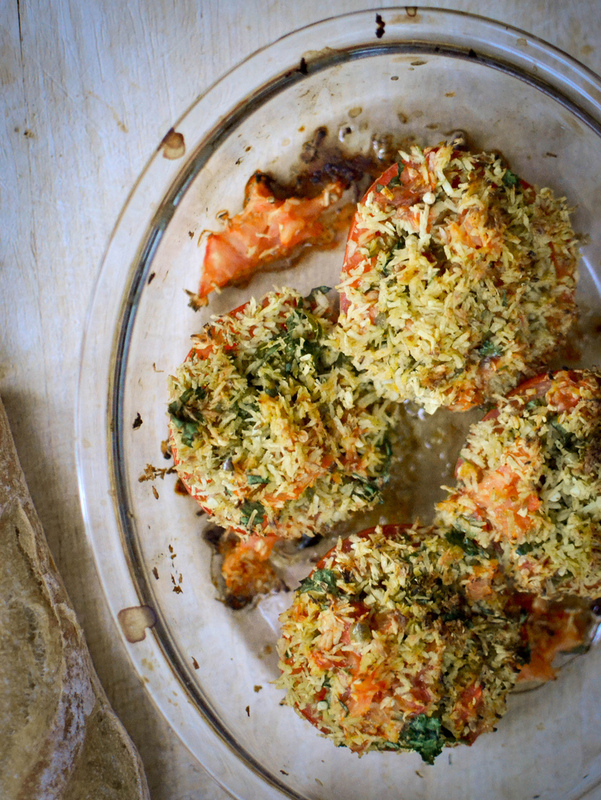 They were fabulous though, and the kids loved them too… although my daughter asked not to have too much of the sauce after she’d tried it once! The book sounds like a treasure trove of interesting recipes – I’ll be looking out for it next time I’m at the book shop. Oh I do love poori. I love the way they puff up when you dunk them in the oil! Try them with plain yoghurt that has some salt and red chilli powder. That’s my childhood breakfast.